1601. “Hubert W Webb,” Find-A-Grave, https://www.findagrave.com/memorial/70101434, 70101434. 1602. “Ruth Mooney Webb,” Find-A-Grave, https://www.findagrave.com/memorial/70099852, 70099852. 1603. “Tennessee Marriages, 1796-1950,” Henry G Webb and Emma Campbell, System Origin: Tennessee-VR-GS Film number: 972790-Reference ID: 2:1VSH9RN Digital Folder Number: 004538725-Image Number: 00410, https://familysearch.org/pal:/MM9.1.1/XDM6-PZ2, https://familysearch.org/pal:/MM9.1.1/V5HH-JP4. 1604. “Population Schedules for the 1880 Census,” 10th Decennial Census Office, Bureau of the Census, US Dept. of Commerce, United States of America, 1880, TN, Hawkins County, District 11, June 19, 1880, George W Brooks, 24D, 1, 85, T9, 1261, 340, 253. 1605. Lee Obbie Webb, “Tennessee Death Records, 1914-1955,” Rogersville, Hawkins County, TN, USA, 25091, microfilm, Digital Folder Number: 004184482-Image Number: 00102-GS Film number: 1876917-Reference ID: vl-cn 25091, https://familysearch.org/pal:/MM9.1.1/NSPR-CCF. 1606. “Anna Hox “Rose” Serns,” Find-A-Grave, https://www.findagrave.com/memorial/112716721, 112716721. 1607. “Obituary,” John Smith Webb, Merced Sun-Star, Merced County, CA, January 19, 1932, 3. LIVINGSTON, Jan. 19 (Special) – Services were held for John Smith Webb, 69, of Merced at the J. W. Guy funeral chapel in Turlock Monday. The Webb family formerly lived in Livingston and have made their home in Merced for the past six years. Mrs. F. E. Olson and Mrs. Manford W. Bennett sang at the services. Interment was in the Turlock cemetery. Pallbearers were J. F. Liles, B. W. Kious, John Anderson, H. L. Shultz, William Raffensperger, and J. M. Finster, all of Livingston. Besides his widow, Mrs. Fannie Webb, he leaves the following seven children: Mrs. W. J. Houghson and J. D. Webb, Canada; T. A. Webb of Missouri; Mrs. L. C. Ploof, Livingston; and C. L. Webb, Max E. Webb and Mrs. Frances Webb Chapman of Merced. 1608. “Thomas Arthur Webb,” Find-A-Grave, https://www.findagrave.com/memorial/73034461, 73034461. 1609. 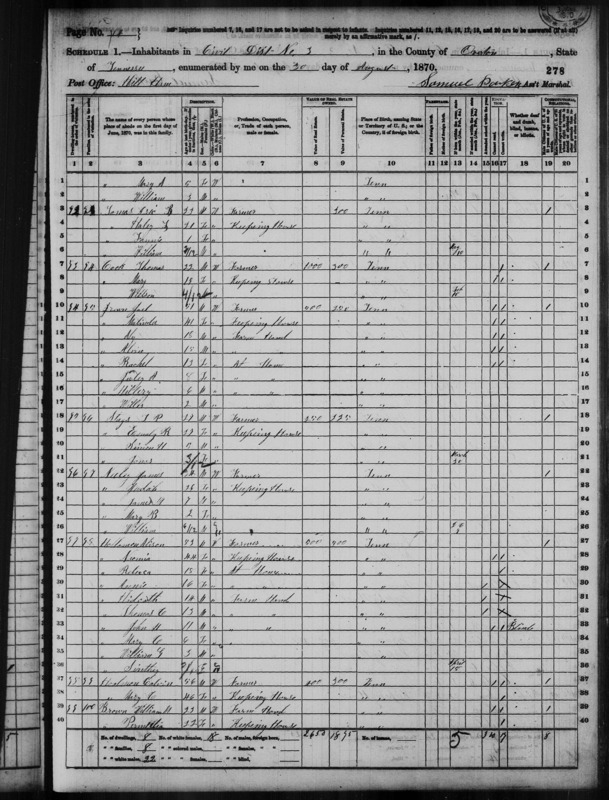 “United States Census,” 1870, TN, Robertson, Springfield, District 3, 15, Bureau of the Census, US Dept. of Commerce, United States of America, June 9, 1870, M D WarBaron. 1610. “Charles C Webb,” Find-A-Grave, https://www.findagrave.com/memorial/39690578, 39690578. 1611. “Edna S Webb,” Find-A-Grave, https://www.findagrave.com/memorial/39690580, 39690580. 1612. “Charles Carney Webb, Jr.,” Find-A-Grave, https://www.findagrave.com/memorial/50284238, 50284238. 1613. World War I, 1918, Tennessee, 2074, Webb, Charley Columbus, “World War I Selective Service System Draft Registration Cards,” September 12, 1918, Bradley County, TN, Affiliate Publication Number: M1509-GS Film number: 1852922-Digital Folder Number: 005152383-Image Number: 03170, https://familysearch.org/pal:/MM9.1.1/KZ6W-85S. 1614. 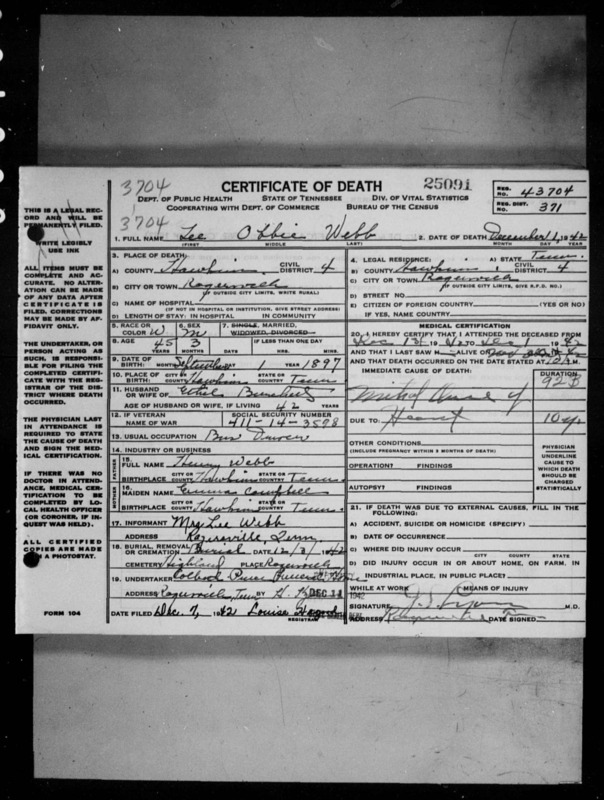 “Kentucky, Death Records, 1911-1955,” John Anderson Burnett, 1923, Glasgow, Barren County, KY, microfilm, Reference ID: 19747-GS Film number: 1912692, https://familysearch.org/pal:/MM9.1.1/N9Y1-DL7. 1615. “John C Zarecor,” Find-A-Grave, https://www.findagrave.com/memorial/68577272, 68577272. 1616. “Rebecca E Zarecor,” Find-A-Grave, https://www.findagrave.com/memorial/68577345, 68577345. 1617. “Tennessee, State Marriage Index, 1780-2002,” J S Webb and F B Reed, May 3, 1896, Robertson County, TN, USA, https://familysearch.org/pal:/MM9.1.1/XD9M-R4V. 1618. 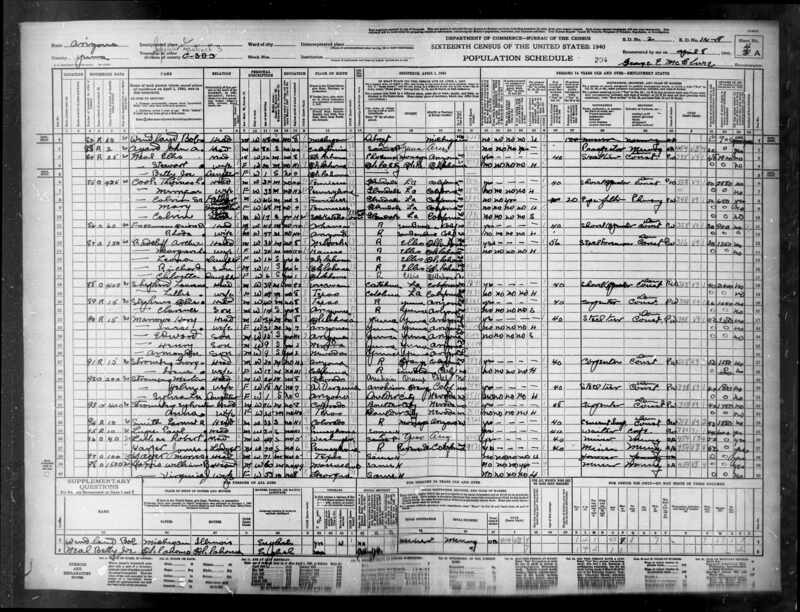 “Tennessee, State Marriage Index, 1780-2002,” William S Webb and Tabitha Zaricor, October 31, 1833, Sumner County, TN, USA, System Origin: Tennessee-ODM-GS Film number: 467485, https://familysearch.org/pal:/MM9.1.1/VNCQ-X5T. 1619. “Franklin County, VA Grand Jury Record,” Franklin County, VA, http://www.franklincountyvagenealogy.com/resources/PDF+Grand+Jury.pdf. 1620. “Millian Webb Hall,” Find-A-Grave, https://www.findagrave.com/memorial/105835392, 105835392. 1621. “Samuel Hall,” Find-A-Grave, https://www.findagrave.com/memorial/105835334, 105835334. 1622. 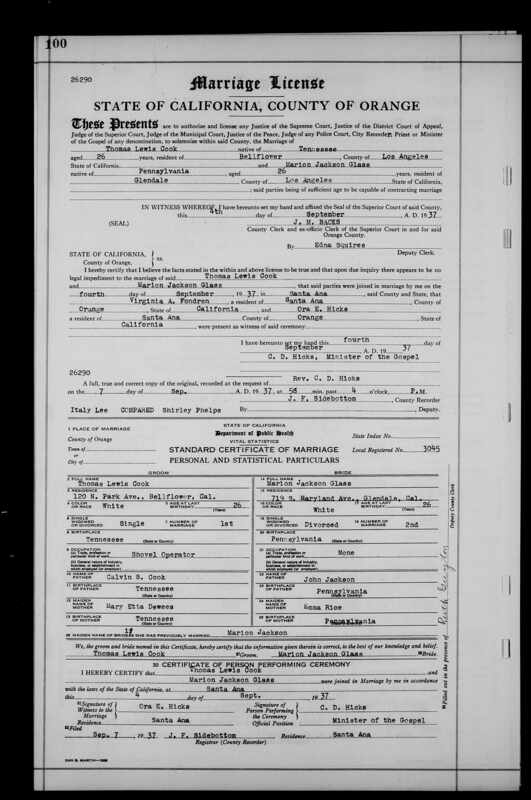 “Virginia, Marriages, 1785-1940,” Asa Perdue and Elizabeth Webb, June 11, 1813, Franklin County, VA, USA, System Origin: Virginia-EASy-GS Film number: 31523-Reference ID: p76, https://familysearch.org/pal:/MM9.1.1/XRQ6-WL6. 1623. “Martha Webb Dorris,” Find-A-Grave, https://www.findagrave.com/memorial/15902830, 15902830. 1624. “William Plummer Dorris,” Find-A-Grave, https://www.findagrave.com/memorial/15902534, 15902534. 1625. “Tennessee, State Marriage Index, 1780-2002,” Nealy Webb and Llewellyn Charlton, March 17, 1918, Sumner County, TN, USA, Pages 70 and 434, https://familysearch.org/pal:/MM9.1.1/VNZR-YTC, https://familysearch.org/pal:/MM9.1.1/VN83-X29. 1626. 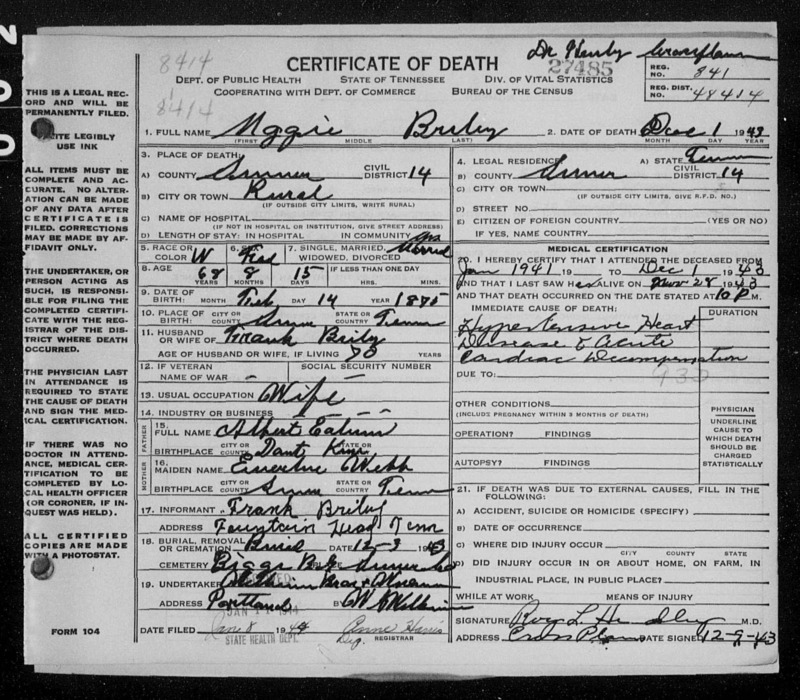 Maggie Briley, “Tennessee, Death Records, 1914-1955,” December 1, 1943, microfilm, Digital Folder Number: 004184883-Image Number: 02753-GS Film number: 2137341-Reference ID: cn 27485, https://familysearch.org/pal:/MM9.1.1/NSR7-9RQ. 1627. “Maggie Briley,” Find-A-Grave, https://www.findagrave.com/memorial/45419682, 45419682. 1628. “Frank Briley,” Find-A-Grave, https://www.findagrave.com/memorial/45419671, 45419671. 1629. 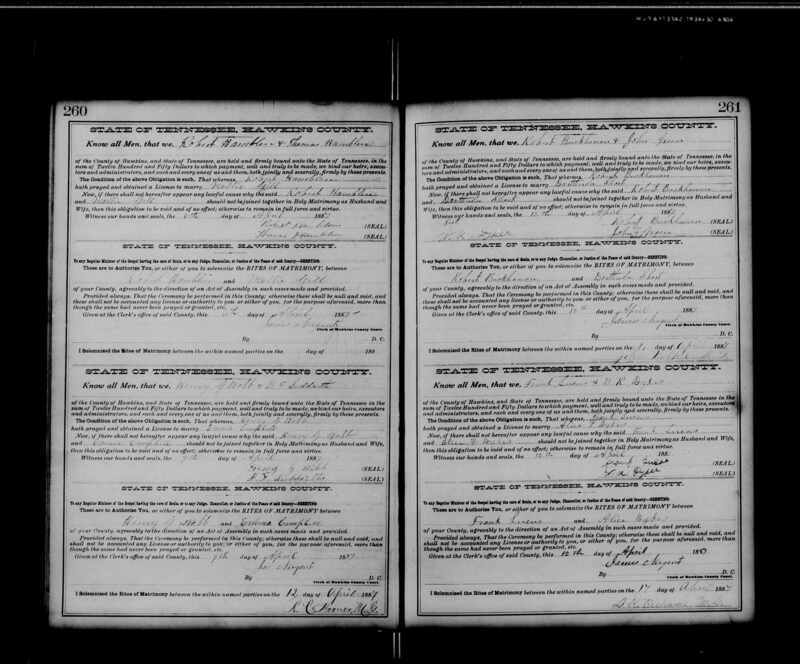 “Tennessee, State Marriage Index, 1780-2002,” Frank Briley and Maggie Elam, November 27, 1892, Sumner County, TN, USA, Page 348, https://familysearch.org/pal:/MM9.1.1/VNZ1-FQM, https://familysearch.org/pal:/MM9.1.1/VNZB-NCB. 1630. 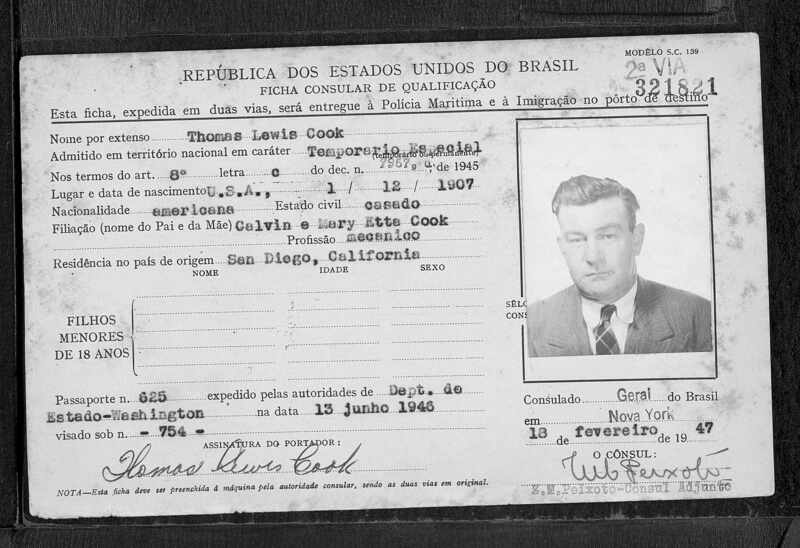 “Brazil, Rio de Janeiro, Immigration Cards, 1900-1965,” Thomas Lewis Cook, February 18, 1947, Digital Folder Number: 004910875-Image Number: 00122, https://familysearch.org/pal:/MM9.1.1/K692-PR8. 1631. 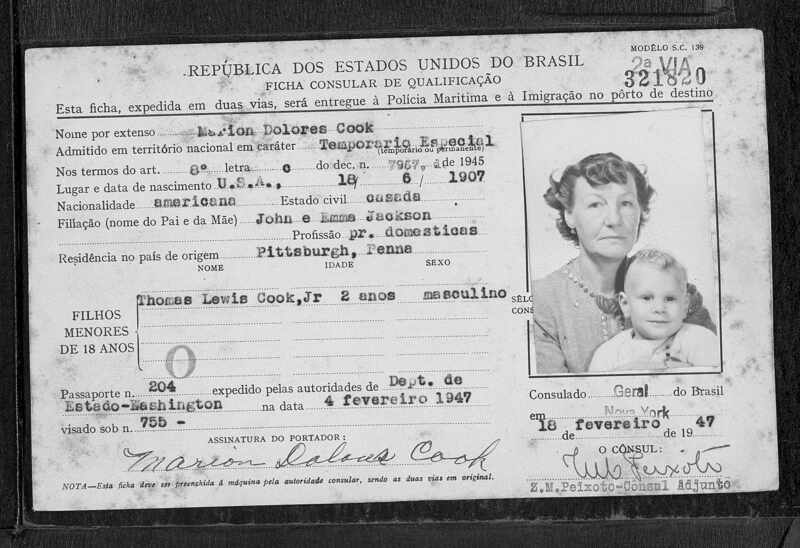 “Brazil, Rio de Janeiro, Immigration Cards, 1900-1965,” Marion Dolores Cook and Thomas Lewis Cook Jr, February 18, 1947, Digital Folder Number: 004910896-Image Number: 00126, https://familysearch.org/pal:/MM9.1.1/K69L-MFH. 1632. “Thomas L Cook,” Find-A-Grave, https://www.findagrave.com/memorial/112302940, 112302940. 1633. “Calvin S Cook,” Find-A-Grave, https://www.findagrave.com/memorial/112302915, 112302915. 1634. “Marion D Cook,” Find-A-Grave, https://www.findagrave.com/memorial/112302929, 112302929. 1635. “Mary L Cook,” Find-A-Grave, https://www.findagrave.com/memorial/112302930, 112302930. 1636. “United States Census: 1940,” Bureau of the Census, US Dept. of Commerce, United States of America, 1940, AZ, Yuma, District 03, April 8, 1940, George E McClure, 4A, 2, 14-18, T627, 115, 428. 1637. “United States Census: 1900,” Bureau of the Census, US Dept. of Commerce, United States of America, 1900, TN, Overton, District 03, June 15, 1900, Arnas C Morgan, 8A, 4, 45, T623, 1591, 203. 1638. “United States Census: 1930,” Bureau of the Census, US Dept. of Commerce, United States of America, 1930, CA, San Diego County, San Diego, April 8, 1930, Grace U Smith, 7A, 37-51, 21, T626, 191, 19. 1639. “California, County Marriages, 1850-1952,” Thomas Lewis Cook and Marion Jackson Glass, September 4, 1937, Orange County, CA, USA, 26290, Page: 100-GS Film number: 2051142-Digital Folder Number: 005698349-Image Number: 00306, https://familysearch.org/pal:/MM9.1.1/K8FJ-SVT. 1640. “Population Schedules for the 1880 Census,” 10th Decennial Census Office, Bureau of the Census, US Dept. of Commerce, United States of America, 1880, TN, Overton County, District 03, Hill Ham, June 4, 1880, S D Burton, 9A, 22, 86, T9, 1274, 269. 1641. 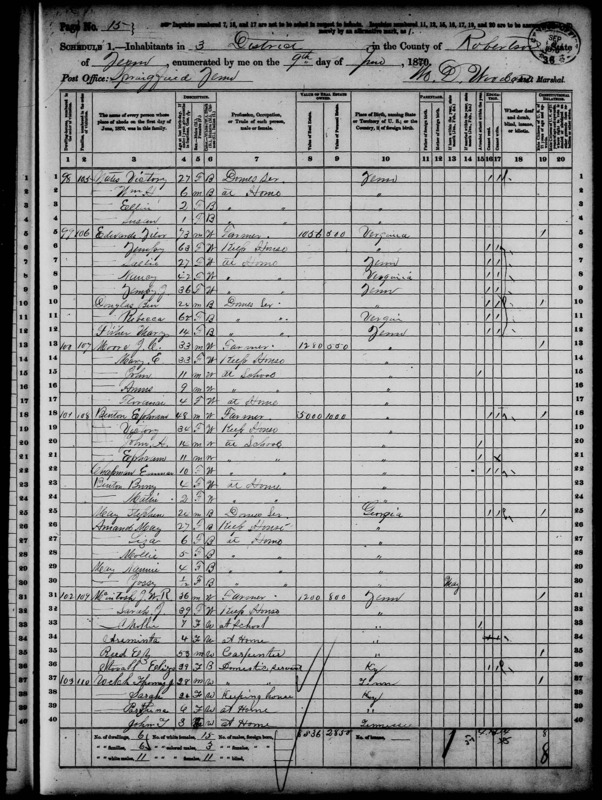 “United States Census,” 1870, TN, Overton, District 03, Hill Ham, 15, Bureau of the Census, US Dept. of Commerce, United States of America, August 30, 1870, Samuel Parker. 1642. “Eighth Census of the United States. Schedule No. 1.--Population,” Bureau of the Census, US Dept. of Commerce, United States of America, 1860, Tennessee, Overton, District 03, Hilham, July 8, 1860, PM Anmatory?, 207, M653, 1267, 176. 1643. “Tennessee, State Marriage Index, 1780-2002,” Earl Loftis and Sallie Burton, January 2, 1916, Jackson County, TN, USA, Page 246, https://familysearch.org/pal:/MM9.1.1/VND8-XWB. 1644. “Earl Terry Loftis,” Find-A-Grave, https://www.findagrave.com/memorial/69990164, 69990164. 1645. Jeanie Loftis-Rensel, “Robert Earl Loftis, Sr,” https://robert-loftis-sr.memory-of.com/About.aspx, May 14, 2011. 1646. “Charlie H Loftis,” Find-A-Grave, https://www.findagrave.com/memorial/17371255, 17371255. 1647. “Ruby Glads Loftis,” Find-A-Grave, https://www.findagrave.com/memorial/17371289, 17371289. 1648. “Joe Martin Loftis,” Find-A-Grave, https://www.findagrave.com/memorial/3827440, 3827440. 1649. “Robert Earl Loftis, Sr,” Find-A-Grave, https://www.findagrave.com/memorial/72609956, 72609956. 1650. “Larkin Briley,” Find-A-Grave, https://www.findagrave.com/memorial/40916687, 40916687.